The Block Party Trailer is more than just a party in a box, it’s a witness wagon on wheels! 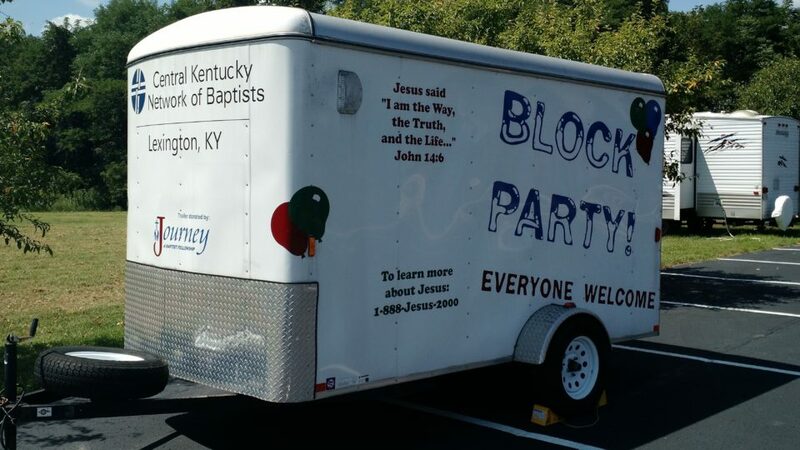 Churches throughout America are using Block Party Trailers and are seeing thousands responding to the Gospel. Fully equipped with all the hard goods you need to host an exciting and efficient evangelistic event the Block Party Trailer is ready to roll. All the church members need to bring are expendables like food, paper goods and witnessing tracts. Priority will be given first to CKNB affiliated churches and/or Kentucky Baptist Convention churches that will be using the trailer in evangelistic activities. The trailer is intended to be used as a packaged resource. Equipment will not be booked separately or removed from the unit. See the documents below for specific information on reserving and using the Block Party Trailer.